Stockholm – The musical Osmond Brothers from Hunstville, Utah, have just completed a two-month “Park Tour” in the beautiful country of Sweden, singing as they go. during their visit in Sweden. They served as outstanding ambassadors for America and the Church. Not only did they perform, but the nine members of the family showed that they also had the missionary spirit. They handed out tracts, placed Book of Mormon copies in the hands of interested people and obtained referrals for the missionaries. Complete stories of the family were printed in newspapers, reporting that two of their sons were serving missions in Canada. Many homes have been opened to missionaries as a result of the good impression the Swedish people received from seeing those young artists perform. 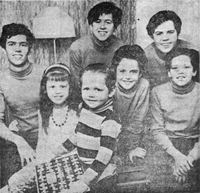 The Osmonds visited different branches on Sundays as they traveled through Sweden. In Stockholm, they spoke and sang at a meeting held for the three combined branches in that area. Investigators attending the meeting were impressed by hearing the testimonies of this Mormon family.